The Together4Tanner Foundation has launched the 5 for 5 campaign, a nationwide fundraising effort with the goal of encouraging 500,000 people to give $5 to the Foundation. With this money, the Foundation will build a memorial baseball park in Craven County which will serve all the youth baseball leagues in the area. Come and play one of the top courses in Eastern Carolina! The recently renovated New Bern Golf & Country Club. The 5th Annual Cloud5 Golf Tournament to support the Together4Tanner Foundation. Registration/breakfast at 9:00am. Shotgun start at 10:00 am. ​There are two ways to register to play or to support the foundation by being a tournament sponsor! or use the online registration below. If you are a 2019 senior at New Bern High School, you may qualify for the T4T Foundation Scholarship Award. Download the scholarship application below and return no later than April 15, 2019. 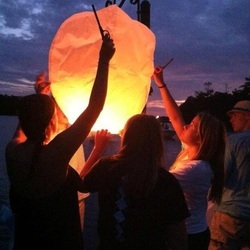 Paper lantern release on the Trent River for Tanner.